Home > Throat Surgeries > What is a Laryngectomy? A laryngectomy is a surgical procedure that is often required when a cancerous tumour has either developed in or has invaded the voice box.It is unusual to require a laryngectomy these days but it can still happen. 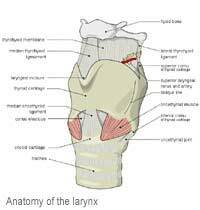 The larynx is the area of the throat that contains the vocal folds or voice box. It works by vibrating as air passes through the folds, producing sound. Why Might It Need Removing? Although it is not common to need a full laryngectomy in modern Britain, there is a small chance that the procedure may still be used. If you have developed a malignant growth in the larynx, surgery may be part of the treatment used to eliminate the disease. Unfortunately, removing the tumour often means having to remove the tissues of the larynx also. It may also be necessary to remove the surrounding tissues and part of the lymphatic tissues that are in the same area if the cancer if thought top be quite extensive. In very rare cases, the larynx may need removing as a result of a trauma or injury. A laryngectomy is carried out using a general anaesthetic. It can be quite a lengthy procedure especially if the cancer has invaded other tissues that need removing. The larynx is removed via an incision to the neck which is made into a tracheostomy at the end of the procedure. Once the larynx has been removed the patient will be unable to carry air through the nose or mouth to the lungs and will have to breathe through the tracheostomy formation; this is permanent. As the oesophagus is a totally separate structure, normal eating patterns can be resumed following the recovery process. After waking from the anaesthetic, you will probably spend a day or so in the intensive care unit so staff can monitor you and make sure the tracheostomy is functioning as expected. While the tissues in the throat heal, the person may be fed using a drip in a vein but will be encouraged to take a normal diet when the staff are happy with the tissues and your recovery. In the long term, if you have no ability to speak at all, you may want to investigate whether there is any technology that can help you. There are voice prosthetics available that can replace the natural sounds of the individual or the use of electrical equipment may be an option which involves using a device strapped to the neck area that creates vibrations that the person can still vocalise. There is support available for those who have undergone this procedure and sometimes it can be very helpful to share your experience with others who have also undergone a laryngectomy and to hear their stories also. Please speak to your specialist or practice nurse for more information on what is available in your area. A laryngectomy is a complicated procedure and can leave the individual with some life changing after effects including an inability to vocalise and adequate preparation for the patient and their understanding and expectation of the after effects is essential to the recovery process.